My chosen Nuart piece is Dr. D’s ‘Buy The World A God’. Dr. D. refers to his art as “subvertising”, a portmanteau of ‘subverting’ and ‘advertising’. 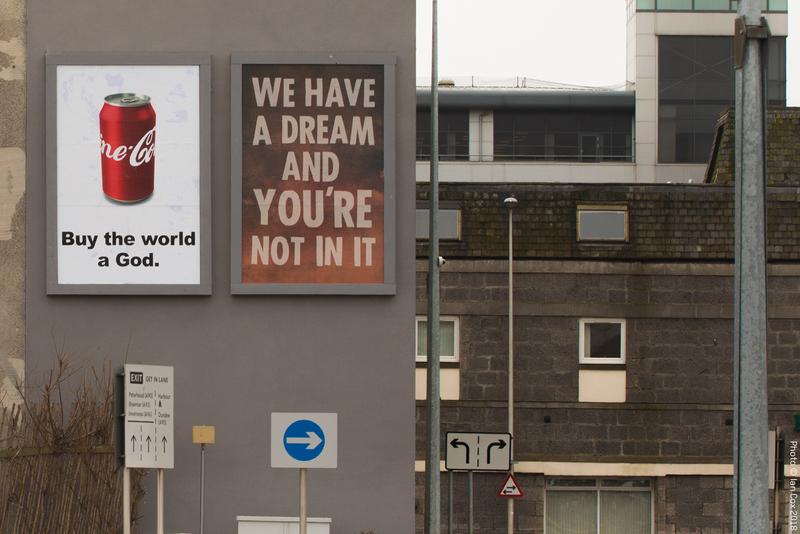 The piece has two frames side-by-side, the first on the left depicts an illustration of a Coca-Cola can, well-lit against a white background, emphasising Coca-Cola’s famous red. This follows a typical archetype of advertising. However, in bold text below the illustration, there is the words ‘Buy the world a God.’ The frame to the right depicts in block, bold capitals ‘WE HAVE A DREAM AND YOU’RE NOT IN IT’. This piece follows the lead of artists such as Andy Warhol and Roy Lichtenstein in appropriating popular iconography as a tool for social critique. It even uses Ben-Day dots, small dots used to create the effect of solid colour from a distance, that were favoured by Lichtenstein in creating his comic book aesthetic. However, the piece is more direct in its criticisms of modern capitalism than that of Lichtenstein and Warhol. The piece is found in the Union Square car park, perhaps Aberdeen’s most prominent hub of consumer capitalism – making the piece a stark reminder of its messages to every customer there to buy the new iPhone and grab a Krispy Kreme doughnut on the way home. The message of the piece comes through in its slogans: ‘Buy the world a God.’ And ‘WE HAVE A DREAM AND YOU’RE NOT IN IT’. The first of these may put across the idea that, in buying even the relatively cheap and insignificant products of our multi-national conglomerates, we are contributing to their wealth and therefore power. At times it does seem like the power of these businesses is God-like: Coca-Cola has an annual revenue that surpasses that of most small countries, Disney has been able to change American law since the mid-twentieth century, and Google will soon house, feed and entertain many of their vital employees in their own village. These acts can be seen as God-like. The second may refer to Martin Luther King, Jr.’s influential speech on racial equality, ‘I Have a Dream’. However, in this piece the dream is likely that of Coca-Cola, who have their own dream to maximise profits and expand. Coca-Cola’s dream can be seen as counter to that of King. Coca-Cola want to increase inequality, in this case economic, in favour of themselves. The second half of the frame ‘AND YOU’RE NOT IN IT’, may refer to the dispassion felt by Coca-Cola to their customers. With so many customers worldwide, a single customer does not matter. ‘YOU’, as an individual, are insignificant to Coca-Cola. I agree that this is much more overtly critical of consumerism than the Pop artists ever were!